This recipe is a smoky spin-off version of your traditional tuna melt. Made with Ahi tuna steak, this recipe also has a gourmet flare over canned tuna. 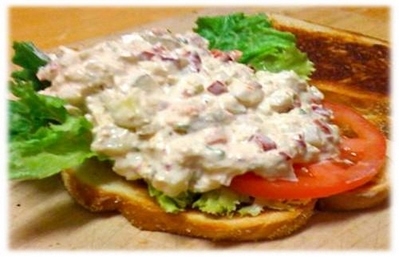 As with all smoked recipes, this smoked tuna melt does take a long time to cook. However, if you are looking for a quick lunchtime meal, you can always smoke the Tuna ahead of time on the weekend and refrigerate it for sandwiches throughout the week. Tuna is a healthy, protein packed meat that is also low in fat, making this recipe a great alternative processed and packaged lunch meats. Cut your smoked Ahi tuna steaks in small pieces and mix them in a large bowl with the Mayonnaise, celery, lemon juice, salt, and pepper. Take your mixed ingredients and spread it out on a piece of French, sour dough, or rye bread. Make sure your slice of bread is buttered on the bottom before placing the ingredients on top. Lay a slice of tomato and cheddar cheese on top of your smoked tuna mixture. Lay another slice of bread on the top to form a sandwich and butter the top of the sandwich. Heat your stove to medium and put your tuna melt in a skillet with the lid on. The lid will help trap the heat in around the entire sandwich and will help melt your cheese. Cook your smoked tuna melt in the skillet until the bread is browned on the bottom. Flip and brown the other side of your sandwich. Your tuna melt will take approximately 2 minutes per side.